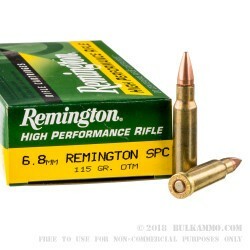 This 6.8mm Rem SPC cartridge by Remington features a 115 grain open tip match projectile. 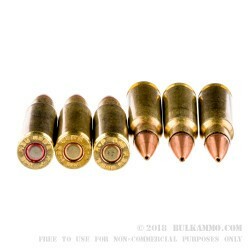 Although the appearance of this bullet may cause some to consider it a hollow point, it is in fact not designed to expand within its target and is rather meant for target shooting. The open tip in this bullet’s copper jacket is where molten lead was poured through to create the core. Because of its manufacturing process this bullet has a nearly perfect weight distribution, giving it superior accuracy and a high ballistic coefficient -- hence the word “match” in its name. You’ll enjoy laser-like precision and very tight groupings when you chamber this round at the range. 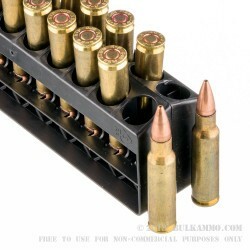 This cartridge also offers a brass casing, a feature that adds additional value to a handloader, especially considering this round’s cost. Its non-corrosive Boxer primer means this cartridge has a great shelf life, too.